Habit: Annual 0.5--4 dm. Stem: 0.3--1 dm, glabrous, sparsely tomentose and glandular proximally. Leaf: basal; blades 0.8--4.5 cm, 0.5--3 cm wide, tomentose abaxially, sparsely tomentose or glabrous adaxially. Inflorescence: 5--30 cm, 5--50 cm wide; branches sparsely glandular to glabrous; peduncles erect, 0.5--2.5 cm, straight, thread-like, glabrous and glandular-hairy distally; involucres 1.8--2 mm, minutely glandular-hairy. Flower: 1--1.7 mm, glandular-hairy with adaxial tuft of long white hairs; perianth white to red, outer lobes generally fan-shaped, inner oblanceolate. Fruit: generally elliptic, 0.6--0.8 mm, glabrous. Chromosomes: n=20. Synonyms: Eriogonum cernuum Nutt. subsp. thurberi (Torr.) S. Stokes; Eriogonum cernuum subsp. viscosum S. Stokes; Eriogonum panduratum S. Watson; Eriogonum thurberi var. parishii Gand. 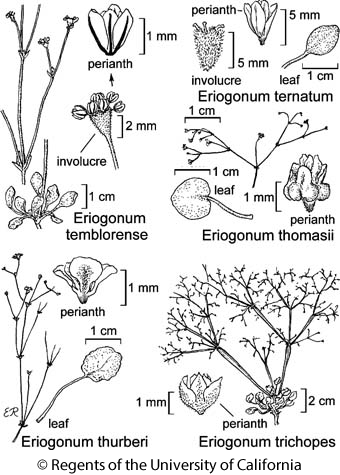 Citation for this treatment: James L. Reveal & Thomas J. Rosatti 2012, Eriogonum thurberi, in Jepson Flora Project (eds.) Jepson eFlora, http://ucjeps.berkeley.edu/eflora/eflora_display.php?tid=24951, accessed on April 19, 2019. No expert verified images found for Eriogonum thurberi. e PR, s DMoj, DSon; Markers link to CCH specimen records. Yellow markers indicate records that may provide evidence for eFlora range revision or may have georeferencing or identification issues. Purple markers indicate specimens collected from a garden, greenhouse, or other non-wild location.